Aston Martin Lola DBR1-2 mod, originally created for SimBin “GTR2” game, is bringing one of the most missing cars to the simulation. 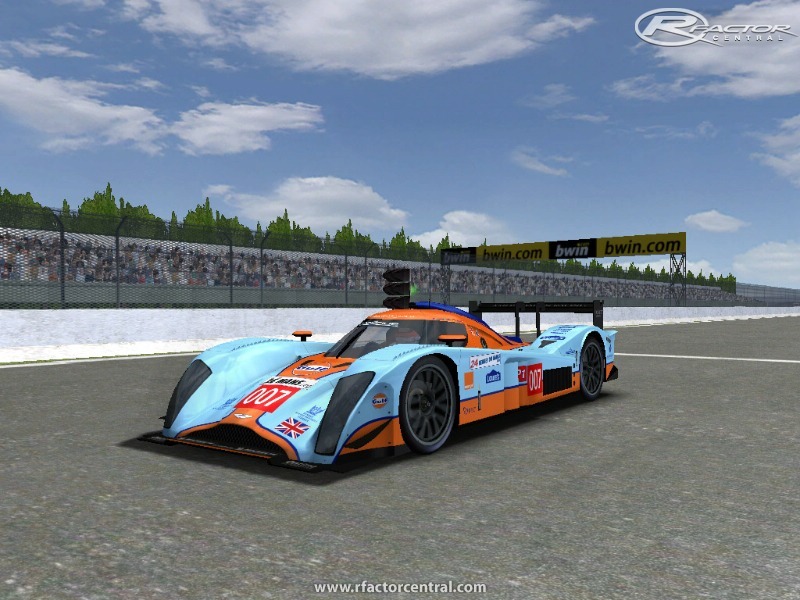 This conversion give you the chance to simulate endurance racing experience while driving Aston Martin Lola DBR1-2 in rFactor! This modification is also compatible with “Série Internationale Du Mans” (also known as ILMS) mod. 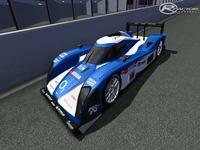 #009 AMR LMS 2010 – (“10209LS_DBR1-2” skin). - use black alpha channel with white numbers in ****EXTRA601.dds & ****EXTRA701.dds files if you want glowing numbers. If you leave car skin without ***EXTRA600.dds, ..... , ****EXTRA701.dds files, car will use default textures from mas archive (without glowing number). (“YourCarSkinName” comes from VEH file: DefaultLivery=" YourCarSkinName.dds" ). Faces for number glow in lights *.gmt files are same size (and at same place) as red square on 008LM skin – so only there you can paste own number. By using “Vehicle Viewer” you can adjust numbers and number glow position in main skin and in extra6, extra7 files. Textures for numbers glow are ~2.0 times biger than square with number on main car skin. - GenString=2 if you want to use Dunlop. This mod contains working mirrors in cockpit view. The drivers don't see left mirror when they are behind the wheel (with default cams) and internal mirror is not included. This mod equiped with original physics. Physics, maded in collaboration with “Carpe Noctem Design Group” to match well-know “Série Internationale Du Mans“ mod (also known as ILMS) will come later. - YourCarSkinNameWING.dds – rear wing. Templates can be downloaded from NoGripRacing page (link is provided below). Use body1.psd template for main skin, body2.psd for extra1 skin and windows.psd for window skin. You can also use skins, painted for original mod, just rename skin files properly. Copy all folders (except “Compatibility”) from zip archive to main rFactor folder. - delete AM_LOLA folder from GameDataSounds folder. I want to thank “Carpe Noctem Design Group” (in front with Tim Collier) for permission, to use some “Série Internationale Du Mans” mod files. Also big thanks to ChaosZero, Mgs_ita and Jolo for support, help and advice. Special thanks goes to my fellows, who helped me on the way with tests, screens and etc. : TJC, NCIS, Evo Monkey and aceofdaplace. - All files, included in this mod (including 3D files, textures, sounds, physics and all other files), are property of Diromo, GutZ, Ghanja, 71GTO, Gatsby and Carpe Noctem Design Group. - Conversion on other platforms (also using in other modifications, packs and etc.) are forbidden, unless you get an authorisation from Diromo, GutZ, Ghanja, 71GTO, Gatsby and Carpe Noctem Design Group. - Use this modification at your own risk. I (Diromo) and authors of original mod will not be taken responsible for losses or damages resulting from the use of this modification. Don‘t forget – it was made by non professional artists and could have some issues. There are currently no setups for Aston Martin Lola DBR1-2. Add a Setup. Love It! Thanks Question for anyone. How do I put drivers names on the teams with no driver showing up? is there any way to make the rest of the car glow with the paint? i just thought of a brilliant TRON livery. Are there any skins for the 2009 LeMans / LMS versions available? Or could maybe somebody make them? http://www.youtube.com/watch?v=IHgo0wEsL_w You can watch there sound mod in use also download link is provided in description. Be sure to check that out! To much channels to export(5). Go under layers (i think) and Flatten Image. Your Photoshop is saying the file is essentially to big for your system, sometimes you can convert smaller files without having to Flatten but I find on the bigger car files i have to Flatten first. Got similar error, while working with templates overall, not only with thous for Astons. I just copy finished RGB layers to "donor" dds file, or saved as png, and later as dds I think, don't remember exactly how I avoid that. They don't work with conversions. And they don't like "quality" gap between this one and whole Enduracers mod. Resume - got finger from them, and I'm happy on my own. Hey diromo why dont you think about asking enduracers for a coopertion with them. Your cars fit way better to the endu mod than to the ilms mod.